As you can see in the screenshots in this post, the Like button now has the like count on the right side of the actual button in its own smaller box. When you click on this new button, it brings the number inside the actual Like box. Previously, it remained outside the box and the Like box simply turned dark blue indicating you had clicked on it. Now the box remains light blue — but again, this count is inside of it stating that “X people” liked the item. A few quick things: this new Like button now appears to be the same size as both the Buzz and new Tweet buttons (and it looks more like each of them) — something which publishers will definitely appreciate. Also, this new button makes it hard to accidentally unlike something because you don’t just click the button again, now you have to hover over the thumb icon to bring up an undo arrow — this is something everyone should appreciate. It seems to be completely random which pieces of content Facebook is testing these new buttons out on. 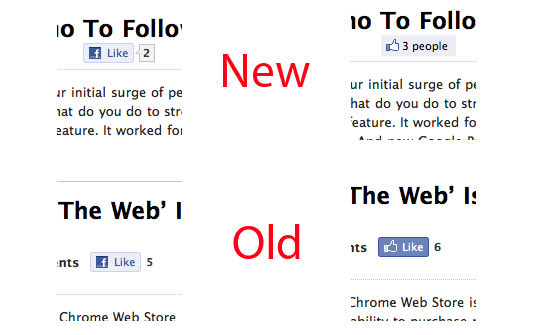 For example, some our our posts have the old button, some have the new button. We’ve reached out of Facebook for clarification about the new button and will update when we hear back. Update: Facebook has just confirmed the roll out of the new button. “We’ve begun rolling out new variations of the Like button to make it more seamless for people to like content and share it with their friends. We’ll have additional details to share in the coming weeks,” a representative tells us.